Can the numbers be trusted? We apply our own analytics to datasets from publicly available sources. Globally, you cannot describe manufacturing by pictures or videos. You have to use numbers, and money is the only language usable to compare activities as different as making frozen lasagna and oil tankers. It’s tricky because currencies change in value over time and with respect to each other. Economists at institutions like the World Bank, however, have been dealing with these issues for decades. They use currency-independent ratios whenever possible; they convert all values into US dollars based on bank exchange rates, and they adjust for inflation to have numbers in constant dollars. National economic statistics are not equally trustworthy in every country. In democracies, they are usually compiled by agencies structured to be immune from political pressure and staffed by professional statisticians; in authoritarian regimes, they are tasked with producing the numbers the rulers want to see. We use these data not because they are perfect but because they are all we have, understanding the need for cautious inferences. These external inputs are massive in manufacturing. The aggregate value-added of the manufacturing sector is its contribution to the GDP. This concept of value-added has nothing to do with customers’ willingness to pay but is widely used by governments, not only for GDP calculations but also as the basis for Value-Added Taxes (VAT). When a company outsources a process, it reduces its value-added by the corresponding spend. When it outsources to another country, it reduces its contribution to GDP by the same amount. A company’s value-added per employee is usable as a measure of productivity across multiple activities, unlike the pieces/operator metrics that are specific to a production line or a product. A caveat, however, is that it can be increased without any improvement in work methods or equipment if there is an opportunity to switch to a product with a higher value added. Throughout the world, communities vie to attract factories, to create jobs and stimulate the local economy. Conversely, factory closings dislocate communities and may even destroy them. Worldwide employment statistics reflect the aggregate effect of such events. They are available from the International Labor Organization (ILO), an arm of the UN. 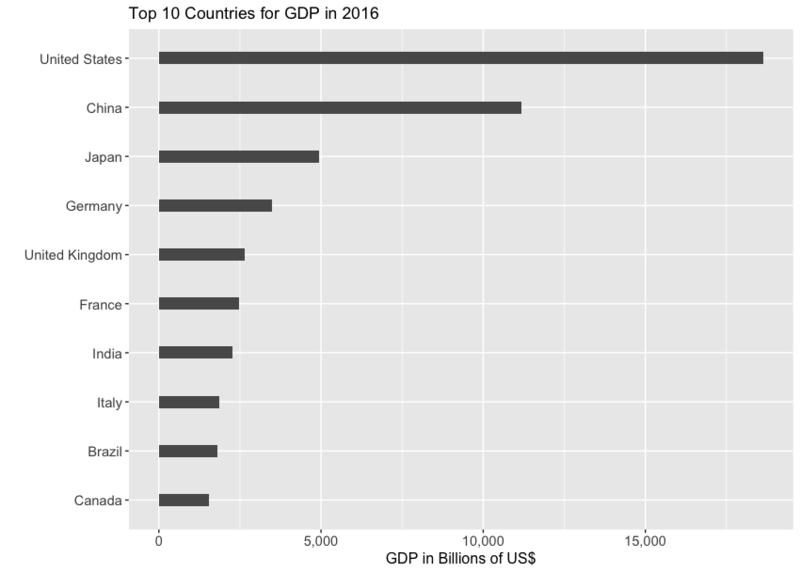 First, we consider the 10 largest economies in the world by their GDPs and by the contributions of their manufacturing sectors. The point is to establish whether the rankings match. The top 4 are the same in both rankings, with the US being #1 overall and China #1 in manufacturing. Among the next 6, Brazil and Canada lose their spots in manufacturing, replaced by Korea and Indonesia. This raises the question of whether a country can be rich without a strong manufacturing sector or poor with one. To check this out, we plot the contributions to per-capita GDP of manufacturing versus all other sectors for the 171 countries in the World Bank database for 2016. With a few, small exceptions, a strong manufacturing sector goes hand-in-hand with a strong overall economy. 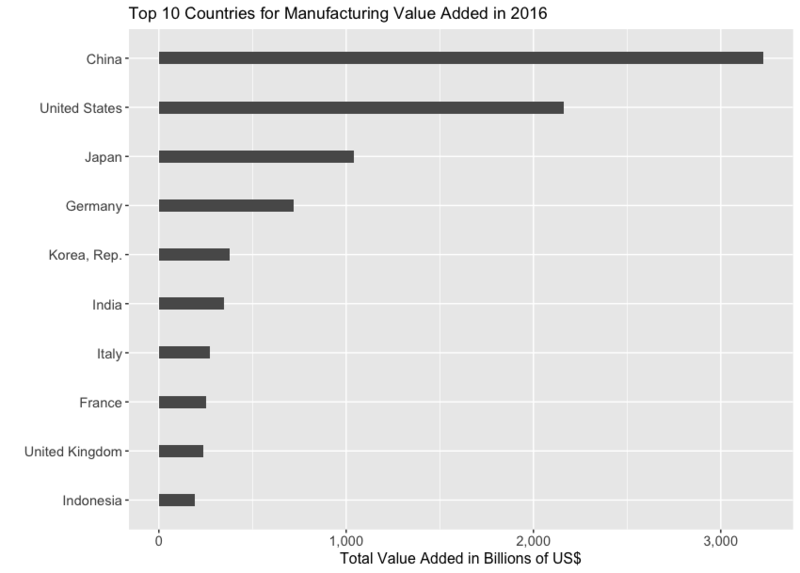 The following figure plots the contribution of manufacturing versus other sectors of the economy for the 171 countries or economic areas the World Bank provides data for in 2016. To keep small and large economies comparable, the figures are per capita. The correlation coefficient is .97, indicating that strength in manufacturing and other sectors tend to go together. The outliers with a high per capita GDP and an undersize manufacturing sector both have populations of about 600,000. They are Macao, with revenues centered on gambling, and Luxembourg, a tax haven. 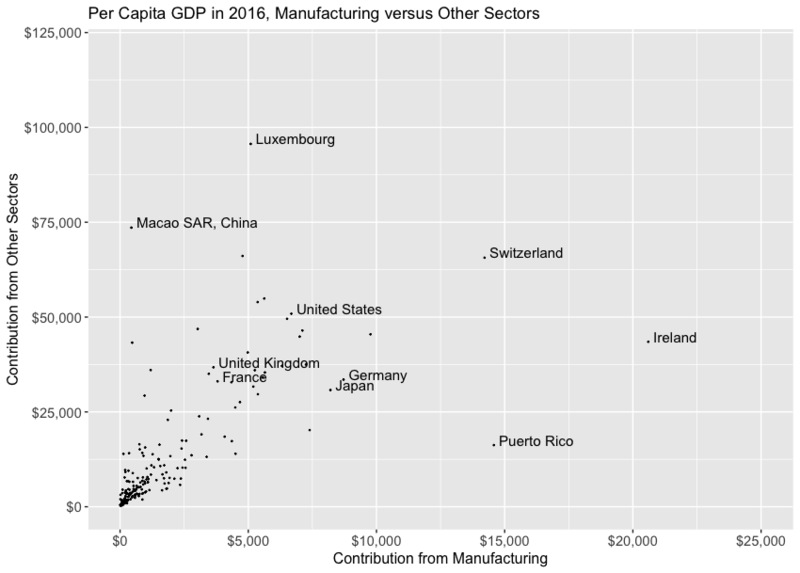 The outliers with an oversize manufacturing sector and a low GDP are Ireland and Puerto Rico, respectively with populations of 5 million and 3.3 million. It has started to decline in China but is still substantially higher than for the other countries in the group, reflecting the fact that China is still an emerging economy. Except for a dip during the financial crisis, the share of manufacturing in the GDPs of Japan and Germany has been steady around 22% since 2002. By this measure at least, these countries have seen no hollowing of their manufacturing sectors. This share is lower for the US, France, and the UK, between 13% and 9%, and shows no decline since 2008. 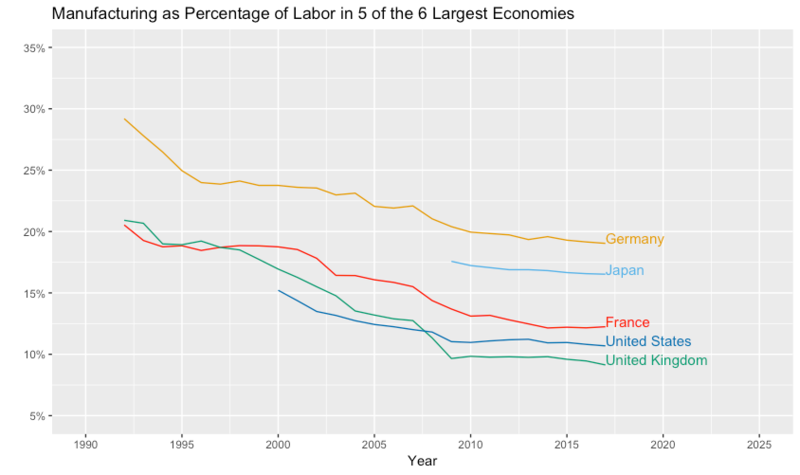 If you go further in time, you see a decline in manufacturing’s share of GDP in Japan, Germany, the US, France, and the UK, but not in the past 16 years for Japan and Germany, and not in the past 10 years for the US, France, and the UK. The horror stories about the hollowing of manufacturing in advanced economies, however, are not about GDP but about employment. This is a different story. 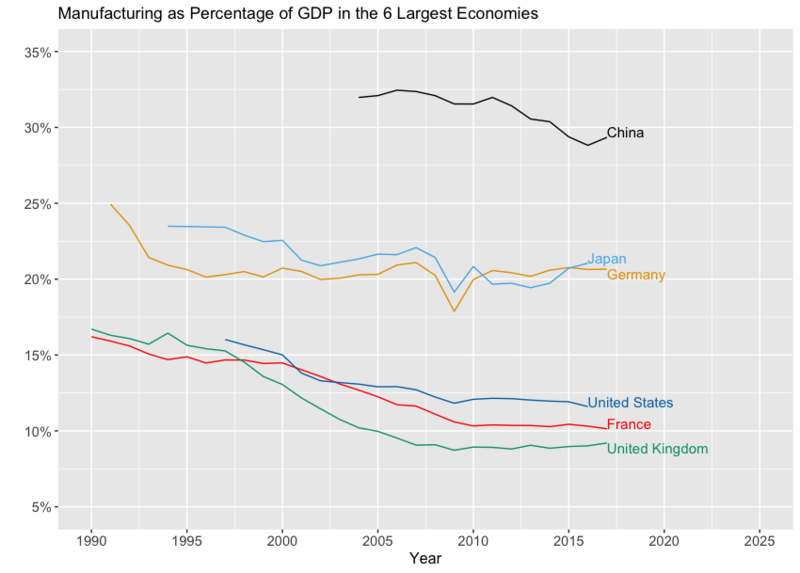 Historical data on manufacturing employment is available for all of the GDP top 6 countries except China. This is unfortunate, given that China’s manufacturing sector is the largest in the world. We plot what we have for the other countries, and treat the special case of China separately. Here we do see a continuing slow decline, and what is happening will become clearer below, when we look at value-added per manufacturing employee. Among the six countries with the top GDP in 2016, China needs a separate treatment. 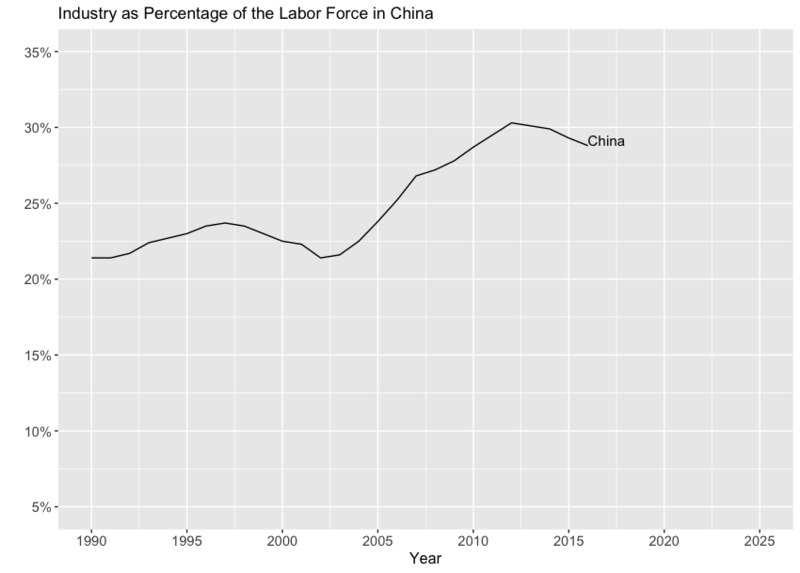 Neither the World Bank nor the ILO provide data on manufacturing employment in China but only on industrial employment. Partial data can be retrieved from other sources, like the US Bureau of Labor Statistics (BLS), or the National Bureau of Statistics of China (NBSC), but we have no way to be sure it is computed the same way as the World Bank data. In particular, there is no consensus on the difference between industry and manufacturing. To the World Bank, manufacturing is “the making of goods or wares by manual labor or by machinery,” and it does not include mining, oil & gas, or construction. The NBSC, on the other hand, does not have a separate category for manufacturing. They lump it under industry, with mining, logging, salt processing and the repair of industrial products. In 2016, according to the NBSC, China had 807 million “Economically Active” people. 776 million of them were employed, and 223.5 million in industry. 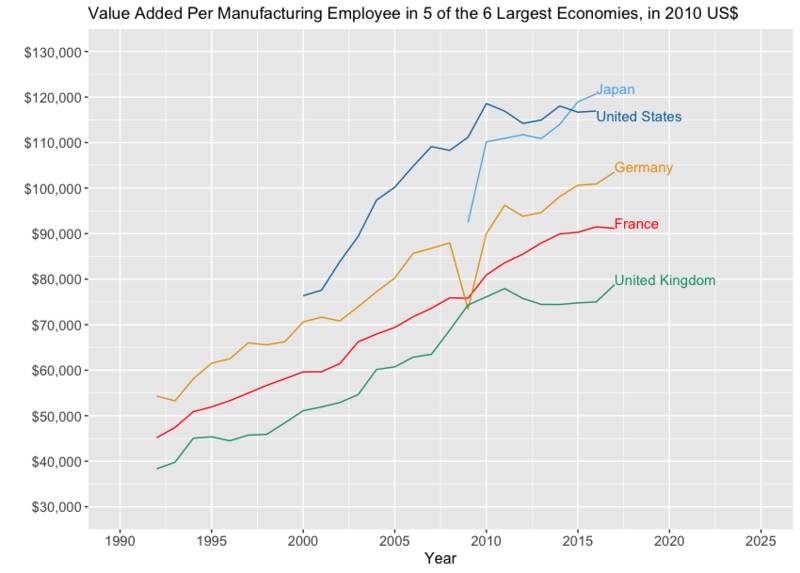 The latest data cited by the BLS for manufacturing is of 99 million employees in 2009, exceeding all the five other top GDP countries combined. For this reason, we cannot ignore it. For 2009, the NBSC gives 211 million for industry, more than twice as many as the BLS estimates for manufacturing. Clearly, numbers based on industry and manufacturing do not belong on the same chart. The chart shows the share of the industrial sector peaking around 2012. It does not, however, allow us to draw conclusions about the manufacturing subsector. Value-added per employee is highest in Japan and the US. It has been rising in the manufacturing sectors of all the advanced economies on the chart except the US since 2010. There are several contributors to this rise and we don’t have the means to quantify their relative influence. Manufacturing in advanced economies has been focusing on high value-added products. It is where they have a comparative and sometimes even an absolute advantage over emerging economies. This is not only luxury goods. There are other products selling for prices that are high with respect to their external inputs. This includes leading-edge semiconductors and pharmaceuticals, aircraft, or agricultural machinery. Methods improvements in Japan in Japan, the US, and Europe have paid off for some companies. What they learned then enabled them to make savvy investments in equipment and technology that use less labor. The size of the manufacturing sector in an economy correlates positively to the sizes of the other sectors. The share of manufacturing in the GDP of advanced economies is holding steady. Manufacturing’s share of the labor force in advanced economies is slowly declining. In the best possible future, today’s emerging economies all become advanced, while today’s advanced economies remain so. Manufacturing will not be the massive source of jobs that, up to now, people have taken primarily out of necessity. Employment in manufacturing will instead be the chosen profession of a minority. Others will work in services, attending to the needs and wants of other people. This future is by no means guaranteed. It may be a utopia but the alternatives are dystopic.